Writer of Comics, Animation, Videogames, Books and a Whole Lot More. I started writing because of my love for comics, so it's amazing to realize that so many of my creations have made it into other media. Fact is, I've been told that I've created more characters that have been adapted into movies, TV, toys, games and animation than any other comics writer except Stan Lee. 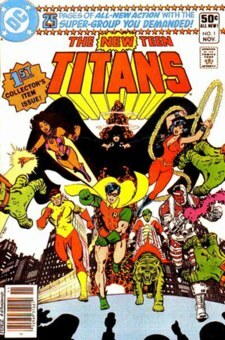 The New Teen Titans, which I co-created with artist George Pérez back in 1980, was a major hit on the Cartoon Network for five seasons then returned as Teen Titans Go! and has become an even greater success. Although different from our comic, aimed more at the younger crowd than the high school/college age audience we were aiming at, it still features our characters, Starfire, Cyborg and Raven and so many others. Teen Titans TM DC Entertainments. All rights reserved. Many of our villains also appeared in the series, from Trigon to Slade Wilson (Deathstroke), The Hive, Mammoth, Gizmo, Thunder and Lightning and many more. To learn about the origin of Titans Tower, and many other never before seen Titans Tidbits, click here. Speaking of the music, the show has one of the best cartoon theme songs in years, written and performed by singer-song-writers, Puffy AmiYumi. This photo of me with the Titans actors was taken during the voice recording for a Titans episode entitled "Deep Six." From left to right: Me, Wil Wheaton (Aqualad), Greg Cipes (Beast Boy), Tara Strong (Raven), Scott Menville (Robin), Dave Coulier (Tramm), and Hynden Walch (Starfire). Not pictured: Khary Payton (Cyborg). Besides appearing in the Teen Titans, Cyborg made his live action debut in Smallville. Cyborg and his father briefly appeared in 2016’s Superman Vs. Batman, movie, and were both featured in 2017‘s movie, Justice League. Cyborg is also set to star in his own movie in 2020. 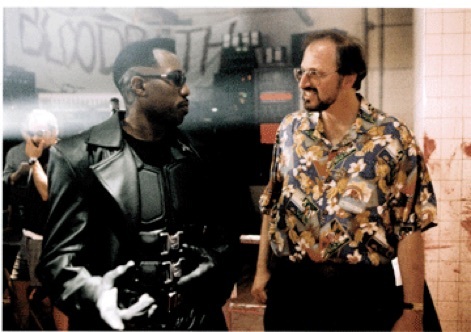 Blade The Vampire Hunter has been featured in three hit movies starring Wesley Snipes, the first directed by Stephen Norrington and the second by Guillermo Del Toro and the third by David Goyer who has written all three movies as well. I was lucky enough to visit the set of the first Blade movie and met with the director and star. It really is a thrill to watch your creations come alive. I later had dinner with Guillermo Del Toro, a real dyed-in-the-wool comics fan. I came up with the idea for Blade while at Warren Magazines editing Creepy, Eerie and Vampirella. Typically, those magazines had 5 or 6 unconnected short horror stories but I decided to try something different and commissioned a half dozen stories which would follow the history of vampires from the first to the last. I was going to write the contemporary story dealing with Blade as a vampire hunter. His origin, personality and look actually came to me in a flash. That's only happened twice in 30+ years. The other time was with the creation of Deathstroke, The Terminator. 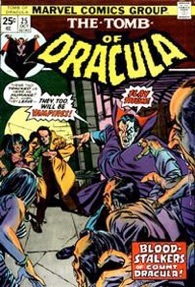 I left Warren before I wrote the story which appeared in Tomb of Dracula #10 but was hinted at in number 9. The third movie, Blade: Trinity features yet another of my creations, vampire-detective Hannibal King, played by Ryan Reynolds. 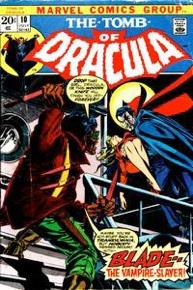 Hannibal King made his first appearance in Tomb of Dracula #25. Hannibal King came out of my love for the old 30s/40s mystery stories. King's very much in that great tradition of hard-boiled detectives, but he has one thing extra going for him: vampire abilities that let him see things and do things ordinary detectives could only wish for. The first Hannibal King story kept his vampire origins secret until the very last panel, although clues were liberally sprinkled throughout the issue. Blade was one of the earliest black comic book heroes, and the first Marvel hero not to wear the typical comic book spandex costume of the time. 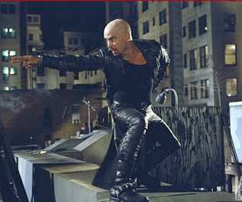 Since Tomb of Dracula took place in a semi "real world," I wanted Blade dressed in somewhat realistic clothes: leather bomber jacket, pants, boots and his special goggles which, because he had vampire blood running through his veins, would let him see in daylight. Yes, he wore a bandolier complete with wooden knives (the better to kill vampires with, my dear), but they were only a fashion accessory. 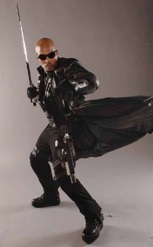 Blade also starred in his own live action TV series. 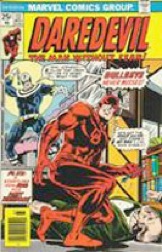 I created Bullseye in Daredevil #131 I wanted a villain who could literally turn anything he came in contact with into a weapon, from a drinking straw to a paper airplane. Yeah, I know it's hard to kill someone with a paper airplane, but, hey, in the hands of a super-villain those paper cuts can be pretty nasty. I also helped design his comic book costume,which was brought to life by artist John Romita. Bullseye's trademarked forehead bullseye target has been morphed into a branded target for the film, a cool idea I wish I had thought of. Bullseye was pretty much a hit from day one, and after his original two-part story. EVEN MORE BULLSEYE NEWS! Bullseye is the main villain on the third season of Netflix’s Daredevil show. And man is he deadly. 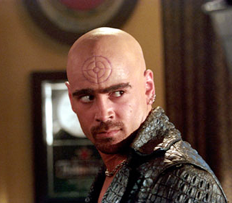 Below is Bullseye as played by actor Colin Farrell. Bullseye is one of the main villains in the Fox movie, "Daredevil." Most critics said that Farrell's Bullseye is the highlight of Daredevil, and I couldn't agree more. He was all about fun and fun to watch. TM and ©2002 Fox and its related entities. All rights reserved, Bullseye TM © 2002 Marvel Characters, Inc. All Rights Reserved. 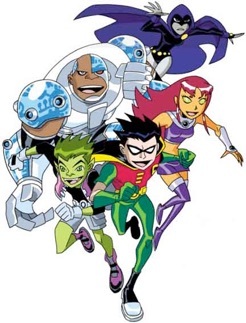 Some of my other characters such as The Teen Titans, Phantasm, Nova, Terrax, Black Cat, and Nightwing have been featured in many animated series. I also created Tim Drake, the new version of Batman's partner, Robin, The Boy Wonder that has been appearing in the comic for the past decade and a half as well as in the animated series. I also co-created a new version of Brainiac, one of Superman's arch foes and Nightwing, who has been voted among the top comic characters of all time. 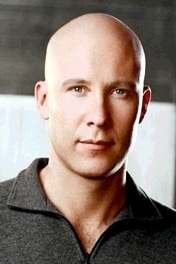 One of my favorite ideas was coming up with the revised version of Superman's arch foe, Lex Luthor. When I was growing up, Luthor was a mad genius who wore prison grays every time you saw him. The typical story began with him breaking out of jail, finding one of his old hideouts, and usually building a giant robot or something equally preposterous in order to fight Superman. I turned Luthor into a brilliant businessman who lived on top of the highest mountain in Metropolis, so its citizens would have to look up at him while he looked down on them. In the comics, Luthor hated Superman because, as a boy, he lost his hair in a chemical accident and blamed Superboy. The Young & The Ruthless: Michael Rosenbaum from "Smallville" • John Shea from "Lois And Clark"
I wanted something a bit more nuanced. My version hated Superman because Luthor used to be a God in Metropolis until Superman appeared. Lois Lane was also his fiancee, again until Superman showed up. In one moment, he lost everything that was important to him. 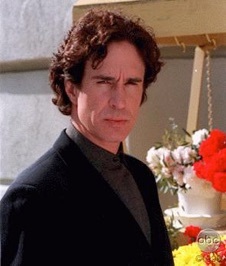 My version of Luthor has appeared in the Superman cartoons of the early 90s as well as "Lois And Clark" and can currently be seen in "Smallville." I'm proud of all these appearances. 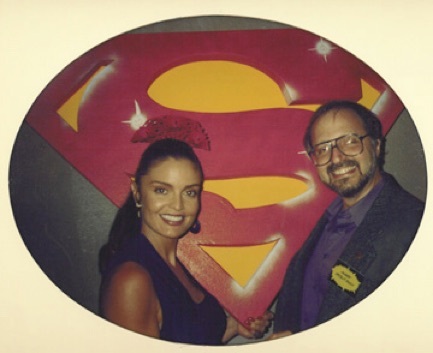 Below is a picture of Cat Grant actress TRACY SCOGGINS and me taken at a DC Comics Christmas party held on the set of "Lois & Clark." I timidly introduced me to Tracy as the man who created her and she instantly fell to her knees and kissed my ring. It was hilarious! Photos are not usually taken on a TV set, but Tracy insisted on us taking this one. Tracy is as nice as she is lovely. Several years later Tracy, her mom and I toured New Zealand’s Weta special effects house together. 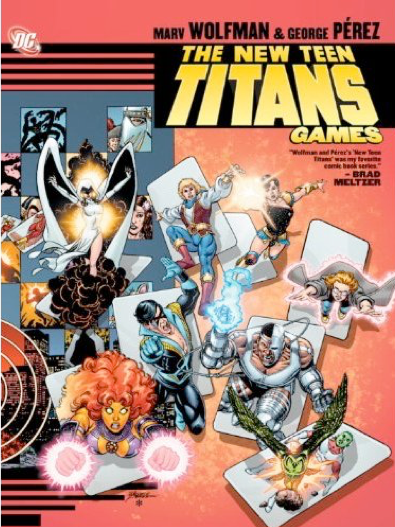 In September, 2011, after a 25-year hiatus, Titans George Pérez and I re-teamed to create an original 120-page Titans graphic novel. You can read about its making here: GAMES: THE GRAPHIC NOVEL. Also featured on Smallville were Cat Grant (who had previously appeared on Lois & Clark), Slade (Deathstroke) Wilson and Professor Emil Hamilton. Oddly, Hamilton had previously appeared but was played by a different actor. In that incarnation Hamilton was killed. Guess he got better. Hamilton also appeared in Lois & Clark played by John Pleshette and by Richard Schiff in The Man Of Steel. Two Emil coincidences. 1: Joe Morton, who played Emil on Smallville is now playing Silas Stone, Cyborg’s father in the Justice League. 2: in a scene in Man Of Steel, Emil, played by Richard Schiff is talking to a STAR Tech played by Alessando Julian who played Emil on Smallville. Talk about your dueling Emils. Cyborg on Smallville played by the late Lee Thompson Young. 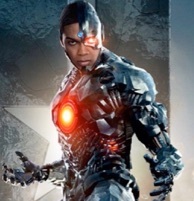 Cyborg in the Justice League played by Ray Fisher. Professor Hamilton #3 played by Alessando Julian and #4 by Richard Schiff. 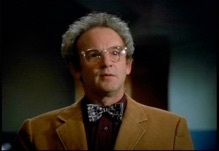 Professor Hamilton #1, played by John Pleshette. #2 played by Joe Morton. 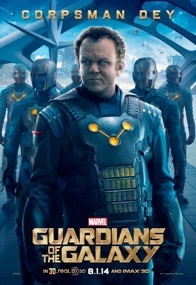 Two more of my characters made the jump to the big screen in Guardians Of The Galaxy. Nova Prime and Corpsman Rhomann Dey, both stemming from my 70s comic, The Man Called Nova. 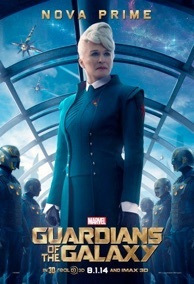 And considering they’re played by Glenn Close and John C. Reilly, I’m in 7th heaven. 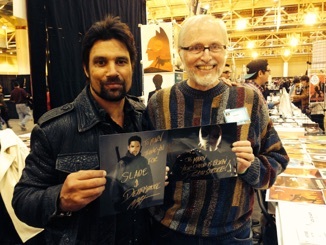 Deathstroke The Terminator, known to fans of the Titans cartoon show as Slade (‘Stroke’s real name is Slade Wilson) had a one-shot appearance on Lois & Clark but that character had nothing but his name in common with our Deathstroke. Stroke’s had multiple appearances on Smallville, but now comes to full life on the TV show Arrow played to perfection by Manu Bennett. 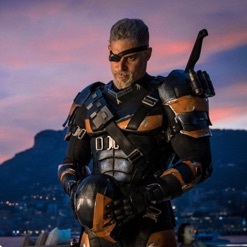 Deathstroke also appeared in the 2017 movie, Justice League, played by the amazing Joe Manganiello. Deathstroke is also slated to appear in other upcoming DC Entertainment movies. Teagan Croft as Raven, Brenton Thwaites as Nightwing, Anna Diop as Starfire and Ryan Potter as Beast Boy. The Titans conquered animation and now it’s steamrolling over its super-hero competitors with TITANS, the live action show on the DCU streaming network. Our babies are everywhere!